BAKERSFIELD, CA -- The legendary “October Classic” returns. For 29 years the “October Classic” was the biggest short track event in west coast racing as it closed out the annual racing season at Mesa Marin Raceway. The event was legendary for the size of the fields, the drivers and fans who traveled from around the nation to be part of the event, and for the legendary parties that took place after the racing was over. MADERA, CALIFORNIA (September 5, 2018) – Race teams from across North America are setting their sights on the 6th Annual Nut Up Short Track Shootout at Madera Speedway, October 5th-6th, headlined by the 150 lap, $10,000 to win RPM Mortgage Pro Late Model feature. The event is fully televised by MAVTV including the 75 lap Lucas Oil Modified Series, 70 lap 51FIFTY Energy Drink Jr. Late Model Series, and 20 lap Mini Cup vs. Bandolero races as well. $1,000 will be offered to win the Late Model B-Main event as part of the lucrative prize pool. Only three drivers have visited victory lane so far in the event’s prestigious history. Mike David won the inaugural running while fellow NASCAR West Series champion Eric Holmes won the following three runnings. 2015 & 2017 RPM Mortgage Pro Late Model champion Buddy Shepherd of Bakersfield grabbed the big prize last year. Activities will begin Friday night with optional practice sessions. Pit gates will swing open at 11:00 a.m. with practices beginning at 3 p.m. for all four divisions. The only fee is $40 per pit pass on Friday. The track will go dark at 9 p.m. Saturday’s program will begin bright and early at 8 a.m. with practices starting at 10:30 a.m.
Time trials will take place at 12:45 p.m. before the first part of the racing action at 3 p.m. Racing will include the Late Model C-Main and B-Main along with the Lucas Oil Modifieds B-Main (if necessary) and the Mini Cup vs. Bandolero feature. Times are subject to change. Opening ceremonies are at 5 p.m. with the full lineup of features to follow. All told, over 400 laps of racing for over 100 race cars is scheduled on the one-third mile asphalt oval. Pre-entry opens on September 10th and is available via RaceMadera.com or by calling (209) 356-1968. Madera Racing on MAVTV airs every Thursday at 5 p.m. and 8 p.m. PST and is also available on the Lucas Oil Racing TV app. The fourth round of the 2018 51FIFTY Energy Drink Jr. Late Model Series airs September 13th. Eureka, CA (September 5, 2018) – The 2018 season at Redwood Acres Raceway is set to conclude this Saturday with the 26th Annual Fall Spectacular presented by Mid-City Motor World. Championships in all of the Acres’ local divisions will be decided, including in the late model division in the Dennis Wendt Memorial Fall Spectacular. The North State Modified Series won’t crown it’s champion Saturday night but they will also be partaking in the festivities for what will be their third visit to the 3/8-mile paved oval. The most points that can be earned for the night for the Compass Community Credit Union roadrunners is 70. Essentially that means Nick Ford has clinched the 2018 track championship for the division going into this weekend as his advantage over Tim Ratzlaff is 81 points. Lindsey Zito holds down third in the standings with Amanda Lohr and Ronny Crump completing the top five. Only ten points separate Bandolero points leader Lane Anderson and second place Aiden Kimberling. The previous event at the Acres on August 18 saw Kimberling part of a scary turn two incident that severely damaged his car but thankfully the youngster was unharmed in the wreck. Third place in the standings is very much up in the air as Kadence Mace and Malessa Miles will decide which drivers gets which position. Trey Daniels holds down fifth. The NorthCoast Lighting & Electric Legends division title has been a season-long battle between Chris Lawrence and Tyler Peach. The margin between the two is 39 points with Lawrence only needing to start the main event for the championship to be his. Aiden Daniels has been the top rookie in the Legends and he leads veteran Brent Mack in fourth place by only 12 points. Katina Baker will likely be unable to advance higher than fifth in the final standings but she will have her hands full holding off fellow female competitors Kylie Daniels and MKinzy Uselton for the coveted position. The bomber division season finale should be a very special event thanks to a boost in the purse from season-long sponsors Fortuna Wheel & Brake and Four-Star Realty. Starting the feature event will pay $75 with the winner taking $800. Second place will receive $400, third place $300, fourth place $200 and fifth place $100. Drivers that tow over 50-miles for the bomber division and attempt to qualify will get a $250 payout. Jim Redd’s 46-point lead over Wyatt Roach in the bombers means he will have to have bad enough issues to not participate in Saturday night’s races. Sam Brown and Ryan Walters in third and fourth should end up in those same positions at the end of Saturday night’s race. Fifth place is up in the air as Bethany Rapp and Doug Way are tied for the position. Either Brian Murrell, Sr. or Eugene Palmer will be the 2018 champion in the Humboldt Hydroponics mini stocks. Murrell, Sr. has a 29-point advantage over Palmer which will be very difficult to overcome. Scott Taylor is locked in the third spot and had a vicious incident in the August 18 race that heavily damaged his machine which hopefully won’t prevent him from being on the track this weekend. Trevor Eacret is fourth and Brett Murrell fifth. The North State Modified Series’ third visit to the Acres in 2018 should be very interesting. 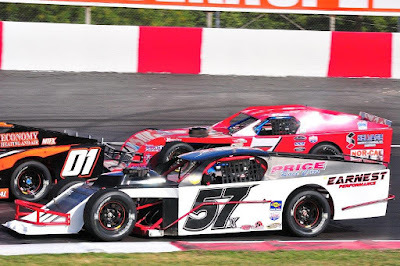 Only three races remain on the schedule and the drivers should be itching to race as it’s been almost seven weeks since the modifieds previous race which coincidentally took place at RAR on July 21. The tour was lined up to visit Lakeport Speedway August 11 but the fires in the surrounding area forced the cancellation of that event. Kris Price leads the NSMS standings and won the July 21 race. It will be the first time since 2014 that modified racing will be part of the schedule for the Fall Spectacular. The 2018 Mid-City Motor World Super Six Challenge Series late model championship will either be in the hands of Mic Moulton or David Henderson. 15 points is the difference between the two going into Saturday’s Dennis Wendt Memorial race. Dane Nissen will be hoping to cap off the season with a victory as he will likely place third in the standings despite missing the June 9 event. Kenny Demello and Scott Baker complete the top five in points. Eureka, CA....... With the cancellation of the August show at Lakeport Speedway due to fires in the area, it has been nearly seven weeks since the North State Modified Series, presented by Protect the Harvest, has been on a race track. But that will soon end this Saturday night, September 8, as the popular touring group will return to the 3/8 mile paved oval at Redwood Acres Raceway in Eureka, California. This will be the third and final show at “The Acres” this season for NSMS.